100% double split South Korean made microfiber. These are the original plush Korean microfiber detailing towels. These high quality towels are 470 gsm, with an 80% polyester, 20% polyamide blend. The Korean Plush towels are extremely soft and gentle because the thick and plush fibers are double split, making them softer and more gentle than normal microfiber towels. 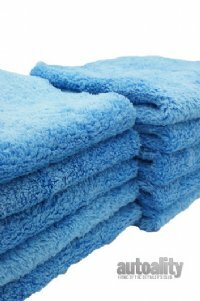 The plush high pile on these towels pull dirt and grit away from your paint and into the towel, preventing scratching and swirls. The ultrasonic cut edges help prevent scratching and streaking from rough edge bindings. These are the perfect towels to use with a quick detail spray, waterless wash or any on other detailing task where you want a soft and fluffy towel!